Should Irish schools provide their students with relaxation methods? 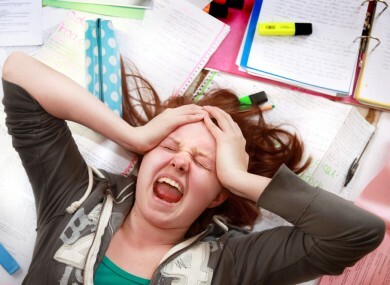 JUNIOR AND LEAVING Certificate exam time is creeping up for thousands of students across the country. It’s a time associated with stress and nerves for both students and their families. So what can students do to try and relax a bit as the exams come ever closer? In Australia, some schools use massage, yoga and homeopathy to help students overcome their anxieties. Meanwhile, third level student at The University of Readings spent time with reptiles to calm their nerves ahead of their exams last month. The reptile zoo was part of University’s wider campaign – ‘RUSU Says Relax’. It included a series of events including a mobile farm, meditation and tai chi sessions, a comedy night and talks on managing exam pressure and getting a good night’s sleep. Closer to home, Trinity College students got to de-stress in a puppy room ahead of their exams last month. Students were allowed to spend about 10-15 minutes in the room with the puppies in return for a small donation to Peata. Irish schools aren’t quite at the stage of puppy or reptile farms but do you think it would be a good idea for schools to provide students with relaxation methods? How did you relax before your exams? Tell us in the comments section below. Email “Yoga, puppy rooms and homeopathy used to de-stress students before exams”. Feedback on “Yoga, puppy rooms and homeopathy used to de-stress students before exams”.